Big News in Detroit - Terrible Ted Lindsay is Back! Big News in Detroit – Terrible Ted Lindsay is Back! 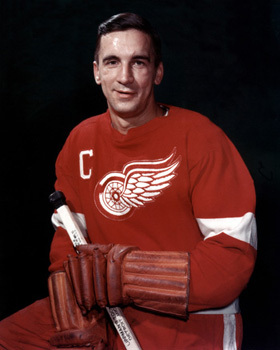 The Detroit Red Wings have just announced that former NHL standout Ted Lindsay, 39, is coming out of retirement to join the Wings for tomorrow night’s opening game against the Toronto Maple Leafs. Lindsay, one of the all-time great left wingers, last played in the NHL for the Chicago Black Hawks in the 1959-60 season. He scored seven goals and nineteen assists in 68 games that season. Former Wings’ captain is making a comeback at age 39. Lindsay played 16 years before his retirement, 13 of them with Detroit. He was the left wing on the famed ‘Production Line’, with Gordie Howe on the right side and Sid Abel at centre. Abel is now the general manager-coach of the Red Wings. Lindsay’s first game back after four years out of hockey will be a milestone – it will be his 1000th NHL game.